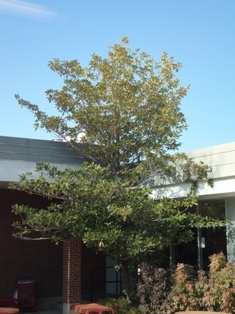 The notion that the very symbol of the American South--the evergreen Southern magnolia (Magnolia grandiflora)--might have hardy forms that would thrive on the windswept steppe of Colorado has tantalized generations of Coloradoans. I have seen small specimens here and there (a number on our York Street grounds) that have come through a few winters promisingly. One of the great pleasures of working at Denver Botanic Gardens is that we are often contacted about these anomalous plants: you can imagine how excited I was when Dan Johnson, Assistant Director of Horticulture, invited me to join him on a quest to see what is likely the largest Magnolia grandiflora for many a mile. He'd been tipped off by a friend who works at an un-named school where this was planted some 15 years ago by a gardening enthusiast teacher. I am being deliberately cagey because this school is not quite ready for prime time public visitation: a tour through our Ed Program is in the works. Suffice it to say that this specimen is stunning: over 25' tall, in the northwest corner of a courtyard where it gets the full blast of sun, but protection from the worst Northers. The huge leaves seem to hold up to our harsh winter sun well, and there hardly seemed to be any damage to any branches or leaves from this winter's bitter cold. And the plant is loaded with seed pods (mostly shed, alas! 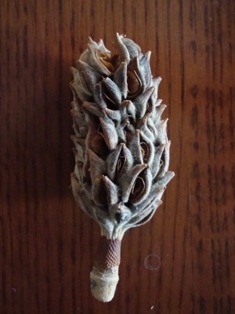 ), so it is obviously a good bloomer...the second picture shows the seedpod. Won't it be fun to visit it in a few months when it sports is gigantic, waxy ivory salver-like flowers brimming with fragrance? What a shock and delight to find this gem! Anyone else out there have a bigger specimen in their garden? ‹ Previous Article: Can Plants Teach Us about Leadership?